TV show dates: April 15, 2017 — June 3, 2017 (US). Performers include: Greg Austin, Fady Elsayed, Sophie Hopkins, Vivian Oparah, Katherine Kelly, Jordan Renzo, Aaron Neil, Pooky Quesnel, Paul Marc Davis, Anna Shaffer, and Shannon Murray. 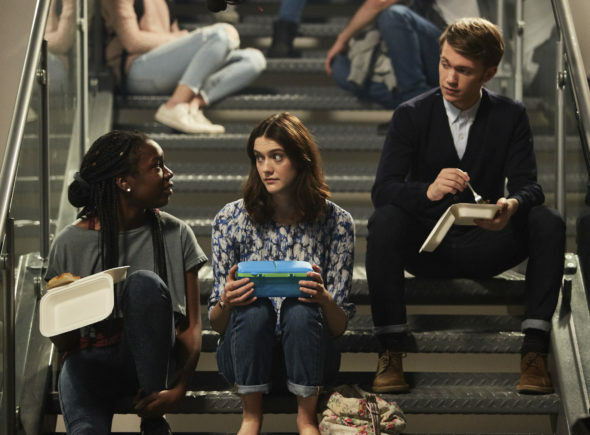 A Doctor Who spin-off, the Class TV show on BBC America follows four students at Coal Hill Academy. Despite their differing backgrounds, they find themselves drawn together by bizarre events. Together, they must wage a covert war against aliens who have travelled through space and time. These kids are trying to balance friendships, romance, their families, and class work, while fighting off the forces lurking for the chance to kill everyone and bring them into Shadow. Under the supervision of Physics teacher Miss Quill (Kelly), Charlie (Austin), April (Hopkins), Ram (Elsayed) and Tanya (Oparah) must rise to the charge to protect Coal Hill, presented to them by the mysterious alien known as The Doctor (Peter Capaldi). A bit “posh” and distant, Charlie Smith has a hard time fitting in at school. He’s not like a normal teenager, because he isn’t one. Charlie is an alien prince from the planet Rhodia and the last of his kind. He retains only one memento of his lost family, but it’s so potent it could be disastrous. When the gruesome Shadow Kin invaded his beautiful home planet, Charlie escaped. At first, the only person he knows at Coal Hill is his adversary, Miss Quill. Eventually, he develops a relationship with Matteusz Andrzejewski (Renzo). When the Polish boy’s parents kick him out after learning he’s gay, Matteusz moves in with Charlie and Miss Quill. No one wants to get on the rigid Miss Quill’s bad side. Her wit can have an extra sharp edge, and she is unhappy in her job as Physics teacher. While she comes across as unreasonable, Quill is deeply lonely and living with a huge burden. She was once a terrorist and leader of the “Quill Resistance” against the Rhodian people, who imprisoned her. They implanted the Arn — an alien creature — in her brain to link her to Charlie and make her his slave. Now exiled in London, Quill must protect her nemesis with her life. Reliable and empathetic, April isn’t the coolest Coal Hill student, but would be the ideal friend. While her classmates think this loner tries too hard, April’s teachers are crazy about her. Despite her painful past and family circumstances, April has a fighting spirit. She also has a big heart, which proves to be both an asset and a liability. Soccer star Ram is dating popular girl Rachel Chapman (Shaffer). As a faithful Sikh, he feel a responsibility to do the right thing. He just wants his dad off his case, so he can enjoy life as big man on campus. Still, he is not without his issues. Ram doesn’t want to taint his image by hanging with the “geeks” in Miss Quill’s class. However, once he realizes the perilous situation at Coal Hill, he starts warming up to the group. Although Tanya Adeola is the youngest of the group, this witty prodigy is three years ahead of them at school. A science superstar, Tanya is quick on the uptake and notices things others might miss. Still coming to grips with the heartbreaking loss of her father, Tanya desperately wants her own group of friends, but her strict mother, Vivian (Natasha Gordon) makes that difficult. Will this ragtag group be able to stand against the alien invasion, save the world, and still get their homework done? Stay tuned. What do you think? Do you like the Class TV show? Should it have been cancelled or renewed for a second season on BBC America? Please a 2nd series. Even a 90 ep. A amazing cliffhanger. I like it very much. Especially right after Dr. Who. 2 full hours of cool. Not a fan of Dr. Who but loved “Class” and hate to see that it might be cancelled! Keep Miss Quill. Kill all the whinny teens (everyone else) and start over.